Me and faith is a funny mix. It occurred to me today that the chain of events that culminated in my break with faith had to do with mysteries of childhood being shattered. Two things happened between 1980 and 1983 that really messed with the stable universe that my parents tried to provide me. It’s hard to talk about them publicly, because I love my parents. It’s a very hard line to draw when you are a compulsive writer and honesty has an edge that’s painful to share. But what I can share is that both my mother and my father lost their respective jobs during that time. My father spent a few dark years as a traveling salesman (when he was a psychologist by trade), and my mother was let go from her post as organist of the church I grew up in. Though I didn’t understand it at the time, there was a dot.dot.dot that kind of trailed off after I was confirmed in 1982. I won’t go into the details, but I went from being the star of the christmas pageant and first in my class at everything to being a lost child who didn’t always do well in school and really could care less about church. And today I saw the kind of kid I could have been, running around at Council being a young leader. It was kind of a shock, because in seeing that reflection of another Helen, I became her. It was a beautiful thing. And yet it makes me sad. I am–fortunately–in a position to restore that balance to my life, but the more I find that my troubled relationship with my parents was what _caused_ my break from faith for 15 years, the more that anger comes back. I thought I had wrestled through all that during counseling–both the therapist kind and the pastoral kind, but I see now that forgiving my parents for what transpired between them and me during my teens and twenties is only part of the problem. I also need to forgive them for what transpired between me and God. Off to Annual Council tomorrow. Having lunch with the aforementioned cousin on Friday between other Annual Council stuffs. Anyone else with a diocesan convention this weekend, have safe travels. I’ll definitely come back with pictures, although we’ll see who I can get to stand next to this here sign I made for our booth. I keep looking at it over on the bookshelf and going, wow, I made a sign. I actually can do much more–graphics and whatnot, but we just wanted something that people could see, given that we just got word that we have a table on Saturday. I should built a portfolio for this kind of thing. Maybe I could go into business doing this for progressive groups all over the country. Make it a side business to fund the progressive piggy bank, because I get asked for handouts to progressive organizations more than I did from homeless men on Philly streets, and that’s saying something. I have learned the hard way that I need to not overextend myself, overvolunteer, or overcommit. But EFM and PEV are the places for me to be. I do consider myself on the grand spectrum to be a moderate. And that sometimes makes it hard. But I do feel blessed to have learned, over the years, that the best way to make a friend across the aisle is to reach over and shake their hand, for any time you truly listen, you will learn something. I hope they are listening to us as I am trying to listen to them, and I hope we both learn. But in the meantime, a journey!! Why are there so many zits on my forehead? 3) What’s a word that rhymes with TEST? Probably me, because I often lose my phone and have to call it to find it, but I can’t check it at the moment, because I don’t know where it is. Bittersweet Symphony, by the Verve, because before I made it my ring tone, it used to get stuck in my head out of the blue all the time. It’s a zipup sweater with jewel-toned stripes. See my profile description in the righthand column. 9) Name the brand of shoes you’ve recently worn. It’s always Doc Marten or Merrell. Bright over here, dark over there… chiaroscuro, I guess. Muttering that it was time to go to bed. Batty told me that it was loud in the bowling alley she was at. Hop on to Rt. 50, drive about a mile, turn left on Jermantown Rd. It’s on the right. 14) What’s a saying you say a lot? Cody, the owl-monkey hybird. I mean cat. Caffiene, caffiene, and caffiene. I’m even birth control free. 4, and that’s been true for three years. 19) Favourite age you’ve been so far? 30 was very good. But 35 was also very good. Just different. well, on the machine that isn’t using a default OSX background, it’s a goody one of the future mr. and me. I’m reading this meme aloud, but before that, it had something to do with flying monkeys and shiny things. Yes, we’re very strange. 23) If you had to choose between a million bucks and being able to fly, which would you choose? Can I go with a half-mill and a Prius? Besides, we all know I have a massive and inexplicable crush on George Clooney and Rob Gifford. **I should note that several of the men in my life were not inclined to get their acts together until after they had children, so I’ve seen firsthand how the latter sentence works. I’ve found a house we can afford. It’s way the heck out, between Front Royal and Middletown, but it’s a perfect starter home, and even with no downpayment and a 8% interest rate, we’d be paying what we are now to rent a small box. This will be my first attempt at even considering buying a house, and it’s about an hour and a half from work, but it’s a mild bike-ride to the park’n’ride. More searching found even more houses within the “what I’m paying to rent now” price range, though this one has the best access to the interstate and all kinds of improvement potential. We’re going to look at it. Please, please pray that we’ll make the “first-time homebuyers” cut. We’re not totally prepared to buy, but we hate to miss a window when God is so clearly opening it. It also turns out that she is planning to visit Richmond next weekend. She lives in my neck of the woods. 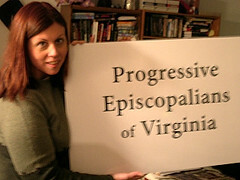 It also turns out that I am going to the 211th Annual Council of the Diocese of Virginia next weekend, also in Richmond. Mom called me tonight to enquire whether I might be interested in saving her some train fare. H: Was that the salad? D (sheepish): No. (meaningful pause.) It was the pie. H (comes around to look): Oh. Pie foul. K: Is this the scene? H: We’re not going to be able to watch it just yet; we’ve had a pie foul. D: Oh! You’re right! (helps himself to half the bottom of the pie, gestures to K) Want some of the pie that didn’t touch the floor? D: Come on, H, you know you want to blow a few more points. H: That’s ok. I’ve already blown too many. H: (realizes what she just said, only to look up and see K and D lifting their pieces of broken pie to their mouths in perfect synchronization): That’s just wrong on so many levels. H: I’m writing this down. D (to K): So is this your first pie foul? I really hope they make the Book of Daniel available on DVD, because I always forget to watch it when it’s on. Tonight, I’ve remembered in time, but the television is already booked for a showing of “About a Boy” for son and future-stepfather bonding. And then they will likely overdose on Firefly episodes (sound of me mock complaining, Whedon-addict that I am). It’s ok, I am making pie and knitting furiously. Son is listening to an audio version of one of the Redwall books. Why is just about every fantasy book read by a densely-accented Brit?